IoT with SAP Leonardo for your digital supply chain. The industrial application of IoT is rapidly becoming a “must” for the successful modern supply chain. 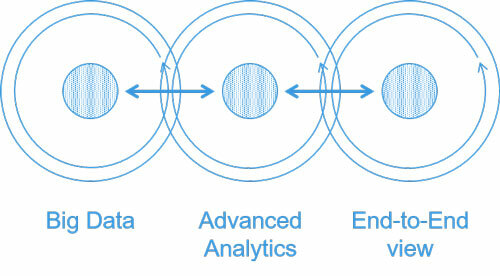 Due to its 3 key value drivers: vast amounts of new data, advanced analytics, and the breaking of information silos. The proliferation of increasingly robust sensor technology now enables organizations to gather vast amounts of new, more accurate data on their physical processes. Big data analytics and machine learning are then able to digest this newly available information to provide actionable insight. Finally, IoT gives a comprehensive overview of the organization by breaking the silos that have historically separated business, IT and physical asset data, creating a holistic end-to-end process view that integrates all data layers. SAP is represented in the IoT space with the SAP Leonardo Ecosystem. Integrating several innovative areas such as Big Data, Machine Learning and IoT, it provides both out-of-the-box products, as well as the tools that enable teams to build custom solutions. Although IoT applications can provide substantial value as standalone solutions, the true benefit comes from their integration with core supply chain solutions and the broader IT landscape. As a leader in the end-to-end Digital Supply Chain space, Westernacher specializes in enhancing existing IT solutions with IoT functionality. We believe that IoT solutions are not a replacement, but rather an additional benefit to IT solutions spanning the entire supply chain, including planning, manufacturing, warehousing as well as transportation processes. Intuitive decision making with IoT for SAP TM. Always know where your fleet is. 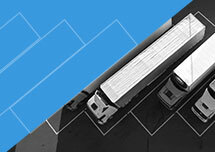 Predict delays, react to route changes and optimize long-term fleet utilization. Monitor the transport conditions of your inventory. Prevent spoilage/damage by reacting to and predicting changes in a timely manner. Automatically track and confirm transportation execution stages. Increase transparency and customer satisfaction, while reducing manual involvement. Collaboration is becoming more and more important in an increasingly connected environment. All transportation-related IoT scenarios can be run in the cloud so that all the parties involved can get live access to the necessary information. You´d like to learn more. 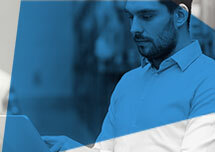 Check out our webinars on SAP Internet of Things with Westernacher. Want to see a demo of an SAP Connected Fleet on Leonardo? Smooth and efficient warehouse operations with IoT. Decrease labor costs and increase throughput through automated RFID scanning processes or geofencing backed by indoor position tracking. Decrease spoilage/damage and improve warehouse & silo planning capabilities by predicting and preventing unsuitable storage conditions. Increase inventory location accuracy, resulting in more efficient warehouse task allocation, assignment, and execution while decreasing labor costs. Automatically assign, monitor and confirm tasks to optimize forklift utilization and increase process automation through geofence position monitoring. 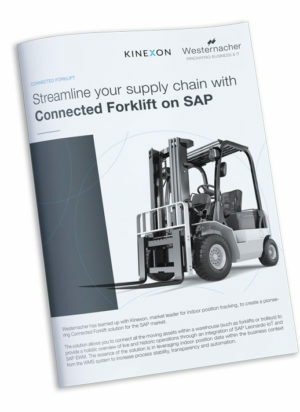 Want to see a demo of a Connected Forklift solution? Seamlessly connecting your yard through IoT. Get advance notice for inbound deliveries, enabling timely preparation for the required yard tasks. Raise inventory location accuracy, enabling more efficient yard task processing and completion. Automatically monitor and confirm Yard task completion, based on resource location and status. Connecting your key assets with IoT. Monitor asset health to address issues before they become a problem. Decreasing asset failure rate, total asset unplanned downtime and increase first-time-fix rates. Monitor asset performance to identify patterns and establish best practices. Engage in a lifecycle of continuous improvement. Want to see a demo of an SAP Connected Assets on Leonardo? Linking all your products with IoT. Keep a live count of your product stock and automate the replenishment process to achieve a more customer demand-centric approach and in-time availability of stock. Make sure your products are stored under the right conditions to ensure customer satisfaction. Keep track of moveable assets to be sure they are in the right place at the right time. Schedule timely deliveries and optimize routes during convenient times, preventing out-of-stock scenarios. Understand how your products perform in real life conditions to improve design and production processes. Gain insight into customer behavior patterns and preferences to adjust sales and marketing strategies. Want to see a demo of an SAP Connected Products on Leonardo? Building on decades of SAP expertise and the new SAP Leonardo offerings, Westernacher has assembled a team that acts as a one-stop-shop for any IoT initiative in the digital supply chain. From selecting the right sensors and establishing the right connection to providing customer analytics in SAP Leonardo, we have you covered. Our approach to IoT is simple: we implement fast time-to-value, ROI-positive initiatives that help achieve specific business KPIs. With our long-standing experience in innovating supply chains, we have been pioneers in the IoT space and already have numerous successful projects under our belt. Learn more about SAP Internet of Things (IoT) with Westernacher. Watch our webinars now. Start your transformation journey now. With our workshop offerings. 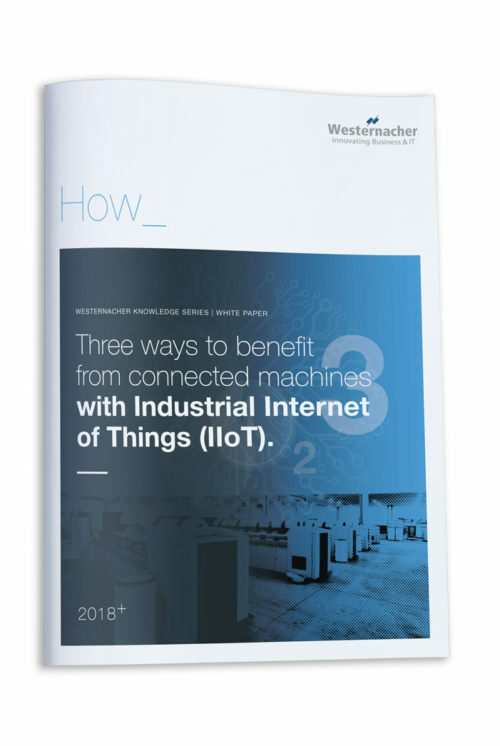 Learn how to use IoT and transform your business with Westernacher. We are in the middle of a fundamental change. Digitization has brought about a new customer with new possibilities and requirements. Companies who can view this challenge as an opportunity will turn it to their business advantage. with Industrial Internet of Things (IIoT). "Alongside blockchain, big data and digitalization, the Industrial Internet of Things (IIoT) is the one of the hottest topics of discussion in the technology world. Alongside blockchain, big data and digitalization, the Industrial Internet of Things (IIoT) is the one of the hottest topics of discussion in the technology world. 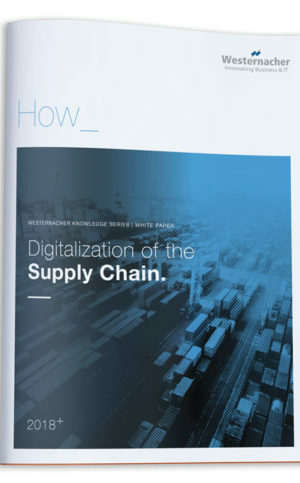 The promise of IIoT lies in improved operational efficiency through smarter, automated decisions driven by swaths of newly available data [...]"
Digitalization of the Supply Chain. "With terms such as ‘digitalization’, ‘Industry 4.0’ and ‘digital supply chain management’ on everyone’s lips, how can we be sure of what sort of technologies fall under these broad terms and more importantly, how are they going to change the management capabilities that are at our disposal? Digital supply chain management can span multiple technologies and include a plethora of ‘buzz words’ but is it more than just hyperbole? Well, yes actually. According to MHI’s 2017 annual survey on next generation supply chains [...]"
Our latest thinking and innovative information on the issues that matter most in business and technology. Check out our latest articles. To read more about our Westernacher article, click here.